Yu-Gi-Oh! TRADING CARD GAME Legendary Duelists: White Dragon Abyss spans the 5 previous iterations of the Yu-Gi-Oh! manga and animated series starting with the original, then moving through GX, 5D’s, ZEXAL, and ARC-V! Focusing primarily on famous rivals like Seto Kaiba and Zane Truesdale, this booster continues to power-up popular strategies based around famous monsters like Blue-Eyes White Dragon and Cyber Dragon! Following up from Yu-Gi-Oh! TRADING CARD GAME Legendary Collection Kaiba, Yu-Gi-Oh! 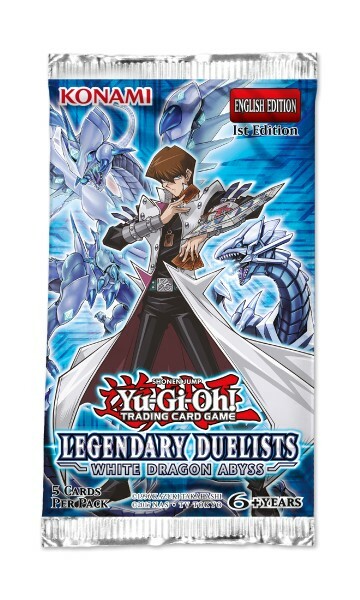 TRADING CARD GAME Legendary Duelists: White Dragon Abyss includes cards to power up both regular Blue-Eyes White Dragon Decks as well as versions of the Deck that employ the Ritual Summoning tactics introduced in Yu-Gi-Oh! TRADING CARD GAME The Dark Side of Dimensions Movie Pack. By combining the Deck basics from Yu-Gi-Oh! TRADING CARD GAME Legendary Dragon Decks with the new cards from Yu-Gi-Oh! TRADING CARD GAME Cybernetic Horizon, Duelists can create a brand-new Cyber Dragon strategy that employs Link Summoning, Xyz Summoning, and Fusion Summoning all in one Deck! Returning from Yu-Gi-Oh! 5D’s, Crow’s Blackwings make their first appearance since Yu-Gi-Oh! TRADING CARD GAME The Dark Illusion with a new Synchro Monster inspired by the very first Blackwing Synchro Monster: Blackwing Armor Master! This new Level 10 Synchro Monster is guarded against all other card effects and lets you gain control of – and later destroy – monsters that dare to activate their effects! If you’re looking for “Photon” and “Galaxy” monsters to use with your Number 90: Galaxy-Eyes Photon Lord from Yu-Gi-Oh! TRADING CARD GAME Battles of Legend: Relentless Revenge, look no further because Yu-Gi-Oh! TRADING CARD GAME Legendary Duelists: White Dragon Abyss also includes new cards for Kite’s “Photon” Deck from Yu-Gi-Oh! ZEXAL! Yu-Gi-Oh! TRADING CARD GAME Legendary Duelists: White Dragon Abyss also includes cards representing famous scenes from the anime series, like the fateful match selection of the Battle City Finals, and Kite’s ruthless “Photon Hand” technique he uses to claim “Number” monsters from his foes.